This is a close enough location we may actually be able to study hands on. This is exciting. 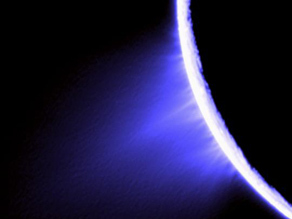 This moon is the biggest mystery in the Solar System, even more so than Titan! A small 300 mile wide ice-ball orbiting Saturn, which possibly has life lurking underneath its surface. I am happy that we will continue studying this incredible moon and unlock more of its secrets. I still want to know more about the HEXAGON on Saturn's North Pole, what is creating that shape and sustaining it for so long? A Hexagon on Saturn? Really. Where can I learn more about that? Sounds like some crystalization has taken place. Yep, Don, the Hexagon, it's really spooky, weird stuff. Still no good explanation for it. The Universe show on History channel features it. It is also easily searchable on Youtube and Wikipedia. Just search Saturn Hexagon. they said it is where science, religion, money and politics collide, so o.k. we get out there with our drilling riggs, and no doubt we find a lot of minerals ect and our drilling crews find organic molecules, so what does that really tell us in the -130 degree heat and the -300 degree cold, i suppose if there was going to be space travellers there would be some very important necessaties that would be needed there , while it is fascinating and interesting, is it really worth the cost spent on the program , i do not mind other people believeing there is intelligent life out there some where , but i have not seen UFO,s or space ALIENS to suggest that there is, would you not think that after travelling all that way that they would not stop in, like land , hello, greetings, come see us when you have time, i can imagine mars or the moon as stop over points if there is going to be space travelling , but is it of any other value than that? Fantastic points altogether, you simply gained a new reader. What may you recommend about your put up that you made some days in the past? Any positive?